This is a post i’ve been trying to avoid writing, because this part of the project wasn’t very much fun to make. I made a lot of weird decisions and bad choices early on that contributed to a horrible end result. I managed to fix it, so most of those mistakes aren’t visible in the finished piece but I still have a lot of regrets about this project, which are never fun to write about. But this blog isn’t just about my successful projects, it’s about all my projects. And some of those don’t go as smoothly as others. This was my original reference when making this skirt. I loved the dramatic pleats and thought that would make the costume far more interesting than having a typical flared skirt, which look like this. But after all the mistakes I ended up with a typical flared skirt! Step one was making the pattern. I used a half dozen sheets of newsprint for this and after a ton of draping I came up with something I liked. Here you can see mistake number one. The hem isn’t nearly wide enough, the pleats aren’t deep enough to sit properly. At the hemline you can already see them being pulled out of shape even though they are made from paper! They’ll be far more prone to holding their shape in this form than after being cut from fabric, so this was a bad sign. These are the front and back panels – these ones aren’t far off, though if I used this pattern again i’d add a few inches to the back. The side panels aren’t a bad shape, they are just half the width they should be to support the pleats I wanted. I cut all the skirt panels out, then marked the pleat lines onto the underside of the fabric and loosely pinned the pleats in place. This is mistake number two, the side panels should have been interfaced or backed with a netting right after cutting them out. They need a support structure to give them enough volume to create the dramatic pleats. Once I liked the way the pleats were sitting I basted them in place. Then I hid the opening for the skirt underneath one of the pleats. This will line up with the side opening of the bodice, and serve as the way to get the dress on and off. I cut a ten inch long slit into the fabric, then covered the edges with matching bias tape. I sewed hooks and bars underneath the bias tape to keep the slit closed. then sewed snaps onto either side, which hold the pleat in place. Here is how it looks open. And here it is closed. In this setting you can’t see the closures, but when the skirt was on my dress form and there was more tension put on the material the snaps were slightly visible. With the closures done I gave the side panels a good steaming, then sewed together all the skirt panels with french seams. This is the stage where the skirt looked it’s best. The pleats aren’t perfect, but the shape is right. Now it was time to add the facing, and this is where I made my biggest mistake. I used a ridiculously heavyweight home decor material which weighed down the hem like crazy and totally changed the nice shape that the skirt had. It may not have been so bad if i’d made the facing a few inches wide, but for some dumb reason I made it eighteen inches wide. Why? I have no idea. That got sewn in with a half inch seam allowance. Then turned inward so the raw edges were hidden. This was sewn in by hand at the hem, and at the top edge of the facing. Now it was time for the first fitting. This went…badly. You can see here how odd the shape is thanks to the heavy facing. It doesn’t drape nicely over the upper portion since it’s weighed down. It’s also about an inch too long – something I ignored at the time, but I realize now is a big issue. But the front view is beautiful compared to the side view, which is awful. Once again length is an issue, but the big problem is that the pleats don’t have enough fabric (or volume) to hold themselves in place. I tried tacking them down at points but that looks bad since the tension of the fabric caused the stitching to be visible. It was a mess. I took out the back seam and re-pleated the side panels, hoping to salvage them, but there just wasn’t enough fabric there. And I didn’t have any material leftover to add additional panels. So I ripped the pleats out. And then I realized the closures on the side panel would be visible. No problem, I could just remove them…but I couldn’t remove the slight tears they made in the taffeta, or the the white placement marks underneath them. My solution to this was to make a giant dart in the side panel. This would remove all the damaged (and excess) fabric at the waistline and I could hide the new closure method in the seam. After ironing out all the crease lines from the pleats I pinned the giant dart, then repeated the process on the other side of the skirt. To add a bit of detail I sewed lace into the top ten inches of this seam. 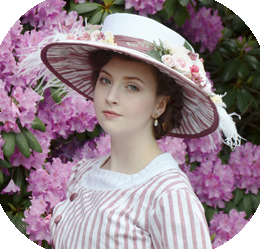 This is the same lace I used on the bodice neckline, which I think is a nice touch. The skirt is still far from finished but it immediately looked way better. I left the top ten inches of the dart open on the right side, so I could add the closures. I decided to use hooks and bars that were stitched onto a piece of twill tape, then sewn onto the taffeta with small whip stitches. This way there isn’t any stitching visible on the top side of the fabric. After making sure this worked I finished the raw interior edge with ribbon and added lace trim to the folded edge. It was a lot of work to get it to this point, but It finally looks okay! I think the skirt gods took pity on me because my closure method actually worked! It looks just as smooth as a regular seam. The front and side panels were sorted, but there was way too much excess material in the back. I decided to do something like this back detailing, but instead of knife pleats I went for cartridge pleats. This was mistake number…I don’t know, five? My skirt didn’t have enough fabric in the back for cartridge pleats, and it turns out taffeta isn’t very forgiving about that sort of thing. I marked the pleat lines onto a faux wool flannel material, which will bulk up the taffeta and make denser looking pleats. I didn’t want the bulk of gathered flannel in the waistline so I sewed ribbon across the top edge. The ribbon will serve as my half inch seam allowance instead of the wool. I pinned that to the taffeta, then got to sewing. From the back it looked like this. And from the front it looked really bad. Since there wasn’t enough material to gather into nice cartridge pleats a lot of my gathering stitches are visible, and the gathers aren’t very even. It actually looks okay from a distance, but up close it’s pretty rough. I finished the top edge of the skirt by sewing it to a two inch wide strip of cotton, with the wrong sides facing each other. The end result finishes the interior nicely and leaves the raw edges on the front side of the material. I’ll sew the bodice onto the top edge of the cotton, then cover the raw edges with the waistband later on. This may not seem like that tiresome of a project, but it really ate up my enthusiasm towards sewing. Every problem felt like such a drag, I didn’t even want to look at it, much less work on it! I think part of the problem is that I don’t usually run into issues when making skirts, so I wasn’t really sure how to fix them. It took days of thought in between each step to come up with something that might help. I think the end result is pretty okay, but i’m still disappointed by it since it’s so far from my original plan. 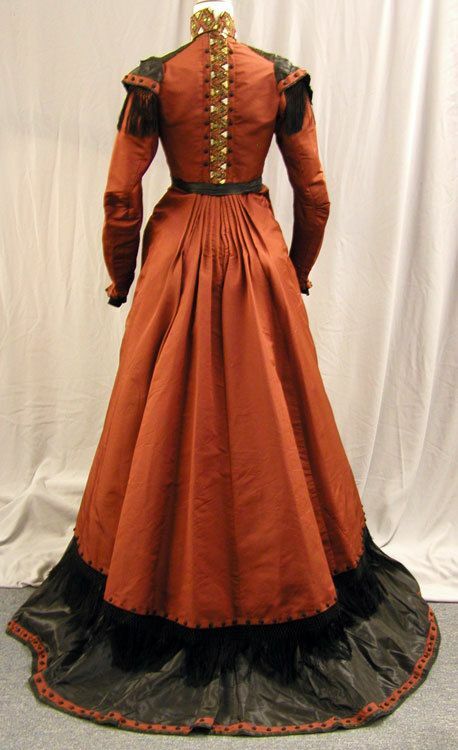 But I definitely learned a lot and plan to use my newfound expertise on making another 1890s skirt in the near future. I’m going to try this skirt on tomorrow and see if any alterations are needed – I have a feeling the hem will need to be lifted, and I may remove part of the facing depending on how the shape looks. I’ll talk about any changes in the next post about this project, which will also cover making the sleeves, the waistband, and show photos of the finished dress! A lot of creating is like this, starting out with one idea, and the improvising our way to a related but different conclusion. I know how frustrating it can be, I have had to walk away from many projects and just take a break for a while in order to figure out the path forward. And you did just that. The skirt, despite everything, is looking beautiful. Brava to you for always pushing yourself. I love watching your creations evolve. I will wager that if you take out half of the height of the hem facing, many issues will resolve themselves. So much weight on a big skirt! And such a beautiful one! Taffeta is a gorgeous looking fabric..But a devil to work with and not very forgiving that you can fudge a few things here and there..But none the less Angela you have done a lovely job..Better luck next time.. I have a solution for the taffeta not taking the cartridge pleats well. (I’ve worked with taffeta five times now) and so far its worked every time. All you have to do is fold the top edge (where you want to cartridge pleat) over by a half inch. It strengthens the taffeta without it being too heavy or bulky. Then all you do is mark the pleat placements down by 1cm and 1 cm apart (I don’t know what that is in inches) and you just sew away. And voila you have nicely formed cartridge pleats on taffeta. This is going to sound so odd, but- have you considered setting up a Patreon? I love reading about your work and your progress (the mistakes, too!) so much, that I could totally see sending a few bucks a month your way. I’m sure lots of other folks would feel the same. I have friends that use it and it’s been the difference between surviving and thriving for them. Just a thought. 🙂 I have no idea if this blog is profitable for you or not, but I enjoy it so much I’d love to see it continue and want to see you do well. Even for all your problems, gorgeous choice of colour!